The Sons of The American Legion (S.A.L.) is a program of The American Legion which includes all male participants whose fathers are currently a member of the American Legion, or if passed away, had served in the armed forces while our country was at war. On all levels, we work together with our local family at Post 432, in promoting and volunteering for service in a wide variety of programs. CAMBRIA, Calif. - September 20, 2008 - The Sons of the American Legion Chapter 432 announced today that it has received the Distinguished Service Award. This is considered the highest award that can be bestowed upon Sons of the American Legion (S.A.L.) chapter. On September 11, 2008 , following the 9/11 memorial and S.A.L.- sponsored free community barbeque, S.A.L. State Detachment Commander, Allen W. Henry, S.A.L. State Detachment Adjutant, Bob Bedell, and S.A.L. State Detachment Children and Youth Chairman, John Mejia presented Chapter 432 with the award as busy S.A.L. members took a brief break from clean-up after the 9/11 BBQ. 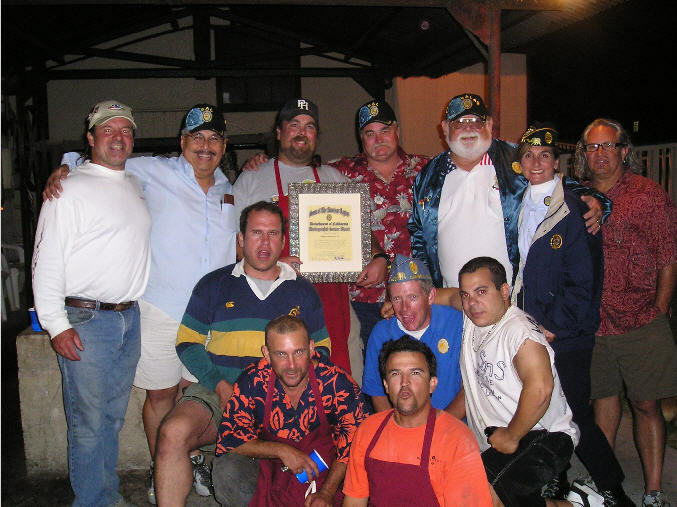 The informal awards ceremony took place, fittingly, at the Cambria Vet's Hall BBQ pit.. S.A.L Squadron Commander, David "Smokey" Drew, received the award on behalf of the entire Cambria S.A.L.S. and said that he was surprised to be the only S.A.L. Squadron to be recognized by the state commanders. The Sons of The American Legion was created in 1932 as an organization within The American Legion. The S.A.L. is made up of boys and men of all ages whose parents or grandparents served in the United States military and became eligible for membership in The American Legion. Together, members of The American Legion, The American Legion Auxiliary and the Sons of The American Legion make up what is known as The Legion Family. All three organizations place high importance on preserving our American traditions and values, improving the quality of life for our nation's children, caring for veterans and their families, and perhaps most importantly, teaching the fundamentals of good citizenship. For more information, go to http://www.legionpost432.com/sal.htm. To uphold and defend the Constitution of the United States of American; to maintain law and order; to foster and perpetuate a true spirit of Americanism; to preserve the memories of our former members and the associations of our members and our forefathers in the Great Wars; to inculcate a sense of individual obligation to the community, state and nation; to combat the autocracy of both the classes and masses; to make right the master of might; to promote peace and good will on earth; to safeguard and transmit to posterity the principles of justice, freedom and democracy; to consecrate and sanctify our friendship by our devotion to mutual helpfulness; to adopt in letter and spirit all of the great principles for which The American Legion stands and to assist in carrying on for God and Country. The Sons of The American Legion was created in 1932 as an organization within The American Legion. The S.A.L. is made up of boys and men of all ages whose parents or grandparents served in the United States military and became eligible for membership in The American Legion. Together, members of The American Legion, The American Legion Auxiliary, and the Sons of The American Legion make up what is known as The Legion Family. All three organizations place high importance on preserving our American traditions and values, improving the quality of life for our nation's children, caring for veterans and their families, and perhaps most importantly, teaching the fundamentals of good citizenship. Sons have always assisted Legionnaires with Legion Family programs. Our Family boasts a combined total membership of nearly 4.2 million members. This year, Sons attained an all time high national membership of over 240,000. The largest Detachment ( Indiana ) has over 28,000 members. Trophies and awards are given to Detachments and Squadrons for the largest membership and the largest increase in membership. Sons focus on much more than just membership. At all levels, Sons support The American Legion in promoting a wide variety of programs. Sons assist their Posts in other activities such as Veterans programs, Veterans Administration home and hospital volunteerism, Children Youth projects, and fund raising. In just the past ten years, Sons have raised more than a million dollars for The American Legion Child Welfare Foundation . Members volunteered over 170,000 hours in 2000 in Veterans Hospitals throughout the country and raised over $700,000 that went directly to VA hospitals and VA homes for a variety of items including TVs, radios, medical equipment, and clothing for the patients. There are many men who are members of, both, The American Legion and the Sons of The American Legion. Often, these individuals started out as young members of the Sons. Then, when they were old enough to serve the military, they also became eligible to join The Legion. Such individuals are known within our organization as dual members. The Sons of The American Legion is one of many organizations that sponsors and supports the Citizens Flag Alliance , a coalition formed to secure flag protection legislation through an amendment to the U.S. Constitution. S.A.L. volunteers work to establish local networks by having petitions available and handing out informational material. They alert their communities to the importance of respect for the flag and they encourage flag education programs in schools and other local organizations. Thanks for showing your interest in joining our organization today. We're confident you will enjoy becoming a member of The American Legion Family, this nation's largest organization dedicated to supporting veterans of the armed services of the United States of America ! If you meet the eligibility requirements for membership in the Sons of The American Legion, we'd love to have you join our ranks! Click on the "Applications" navigation button and download the form and send in the appropriate documentation. You can also click on the "Contact Us" navigation button and get the information to give us a call or send us an e-mail. You would also be eligible to join the Sons of The American Legion if you are the male descendant (stepsons and adopted sons included) of a veteran who died in service during World War I, World War II, the Korean War, the Vietnam War, Lebanon, Grenada, Panama, or the Persian Gulf War (see specific time periods for service during these conflicts listed below). You would also be eligible to join the Sons of The American Legion if you are the male descendant (stepsons and adopted sons included) of a veteran who died subsequent to his or her honorable discharge from service in World War I, World War II, the Korean War, the Vietnam War, Lebanon, Grenada, Panama, or the Persian Gulf War (see specific time periods for service during these conflicts listed below). Perhaps the biggest benefit one receives as a member of the Sons is the satisfaction of knowing you are helping others in your community and elsewhere. However, there are also some tangible benefits available through commercial vendors. Sons are eligible for almost all of the same discounts that are available to members of The American Legion. Just click here to look at a list of many consumer benefits available to members of The Legion Family.